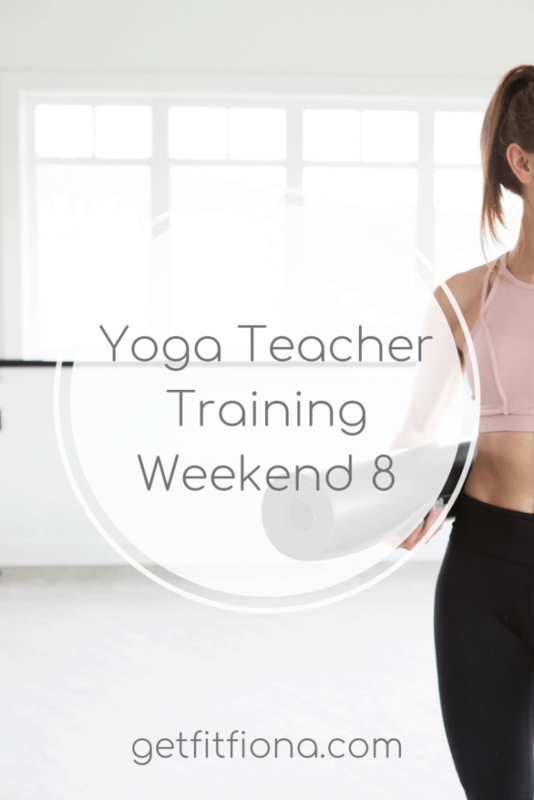 Today I’m sharing a recap of my weekend at yoga teacher training. The weekend of yoga teacher training started off with a 20 minute centering and meditation, followed by discussing the art of teaching. We covered all those things that you don’t notice if they’re done right, but you do notice as a student if they’re not done right (music, mat placement, temperature of the room, etc.). The first half of the morning was spent workshopping about 10 poses that we were assigned the week before. It’s so interesting to see how the same pose can look on three different people depending on their bone structure, tight muscles, length of arms/torso/legs, and injuries. It was a really good reminder that there’s no one “right” way to do a posture. After lunch on Saturday we finished up talking about the art of teaching (including how to have a student mindset as a teacher) and then moved onto sequencing. We talked about how to sequence a yoga class, to make sure it’s balanced, and how to link the poses together. A lot of thought and effort goes into creating a good class that flows well. We learned about the difference between classes that have a theme and those that have a peak pose. We then got into groups of 4 or 5 and sequenced a class. It was a lot less intimidating putting together a class as a group than it was doing it on my own. My group decided to do a peak pose class, with our peak pose being camel or ustrasana. The second morning of the weekend we studied the muscles of the rotator cuff. Shoulder injuries are relatively common, so I know I’ll encounter students with rotator cuff tears in the yoga classes that I’ll be leading. Ut was great to get some ideas on how to modifyy poses for shoulder issues. After we learn some anatomy we always do a yoga practice that focuses on the body parts we had just learned about. On Sunday we did handstands. Since I have wrist issues, I did forearm stands instead. I’ve never really had a chance to try forearm stands in a class before, so it was definitely out of my comfort zone, but I’m so glad that I got the opportunity because it went better than I thought it would! We were taken through it slowly with lots of steps before full handstand. If handstand wasn’t something that could happen. there were lots of other options. We used the wall and a partner to spot us so there was lots of support. I managed to get my torso perpendicular to the floor with my legs parallel to the floor with my feet on the wall – think of an upside down L shape. I was pretty excited to get to that point considering it was my first time trying. Since we covered all the steps leading up the full handstand I know where I need to go next to get to handstand down the road. We spent the first half of the afternoon workshopping some more poses and really going into detail about each one of them and how to modify them. I was one of three people who demonstrated bound angle pose or baddha konasana. Once again, it looked different on each one of us, as were were all doing it right considering our own unique bodies. 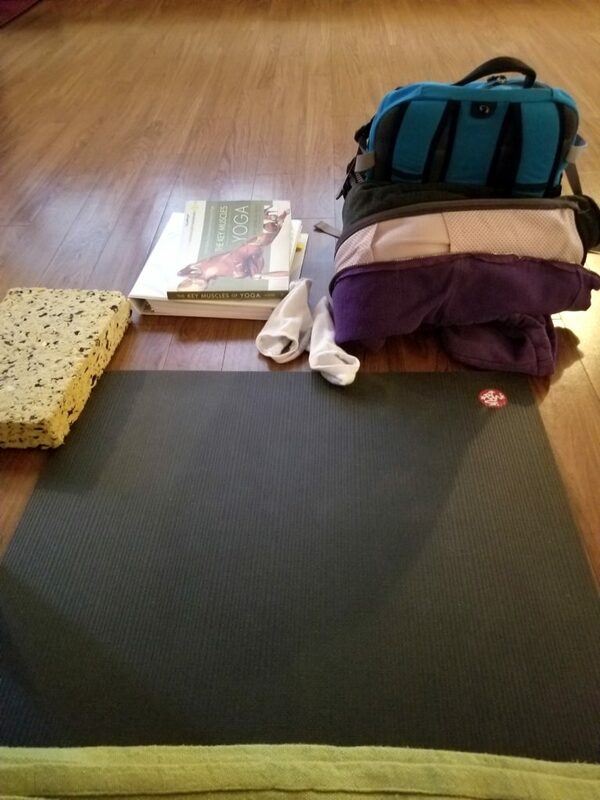 The second half of the afternoon was spend doing an ashtanga practice. I knew I was in for a super sweaty practice, and that’s exactly what Igot. I did a bunch of postures in the primary series that I’d never tried before, so that was fun, even though I did a whole lot of modifications. Over the next two weeks I get to create a 45 minute practice that I’ll be teaching to a small group of classmates in two week’s time. Now that I’ve learned some more about sequencing, I think it’ll flow better than the 30 minute class that I put together before Christmas. 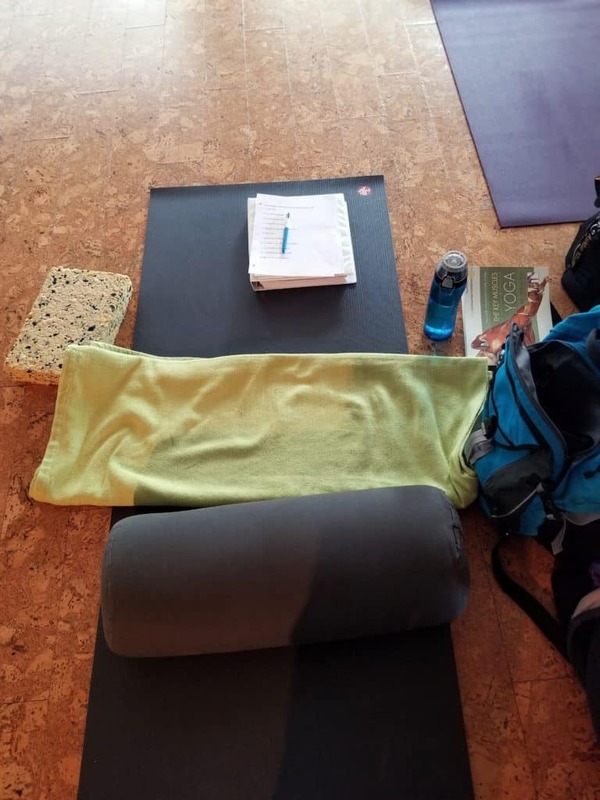 I’ll also be taking another test during our next weekend of yoga teacher training. This one will focus on pose names (both English and Sanskrit) as well as which muscles are used in each pose. Needless to say, I have a lot of preparation to do over the next few weeks.